In the past decade, runtime verification (RV) has gained much focus, from both the research community and practitioners. RV combines a set of theories, techniques and tools aiming towards efficient analysis of systems’ executions and guaranteeing their correctness using monitoring techniques. Major challenges in RV include characterizing and formally expressing requirements that can be monitored, offering intuitive and concise specification formalisms, and monitoring specifications efficiently for functional and non-functional behavior. Despite the major strides made in recent years, much effort is still needed to make RV an attractive and viable methodology for industrial use and to apply it to wider application domains, such as security, bio-health, power micro-grids. 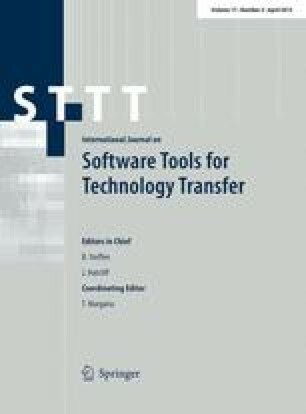 This special issue of STTT proposes extended versions of four papers that have been selected from the runtime verification track at ISoLA 2012 (Margaria and Steffen, Proceedings of the 5th international symposium on leveraging applications of formal methods, verification and validation, 2012). The work of the L. D. Zuck was funded in part by NSF award CCF-0916438. We would like to thank the organizing committees of ISoLA 2012 for setting up such a successful event, the programme committee and reviewers of the conference and the special issue of STTT for helping with the selection of papers, and all authors who contributed to the track. We would especially like to thank the authors for providing us with such excellent papers, and the referees for their diligent work.